Paris, City of light, city of love, us poor provincials do occasionally manage to get up to the nation’s capital to drink in the heady cosmopolitan atmosphere of culture and pollution. 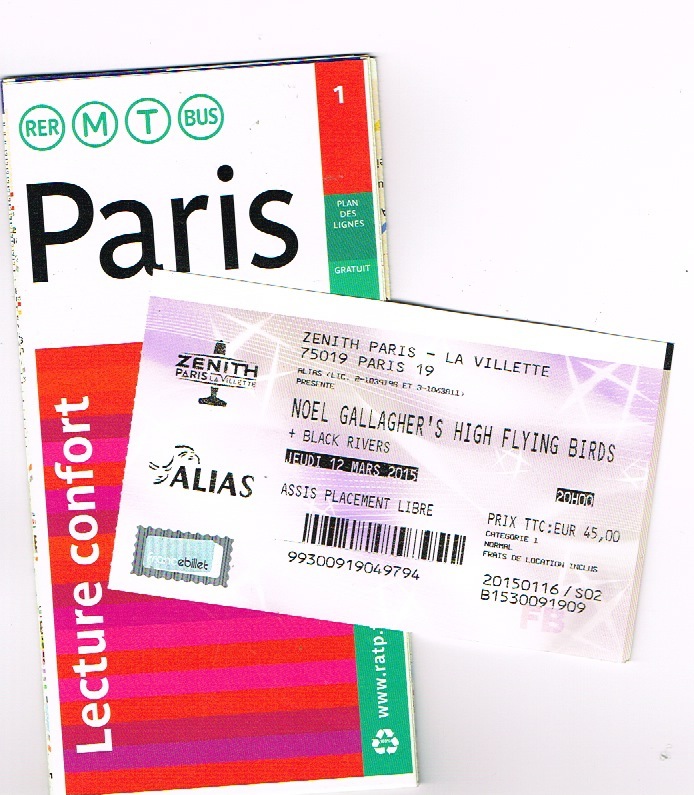 So, last week, made it up to Paris to see Noel Gallagher, making up for the numerous times that I have missed Oasis. Of course, all journeys are excuses for putting pen to paper. Two Parisian offerings. 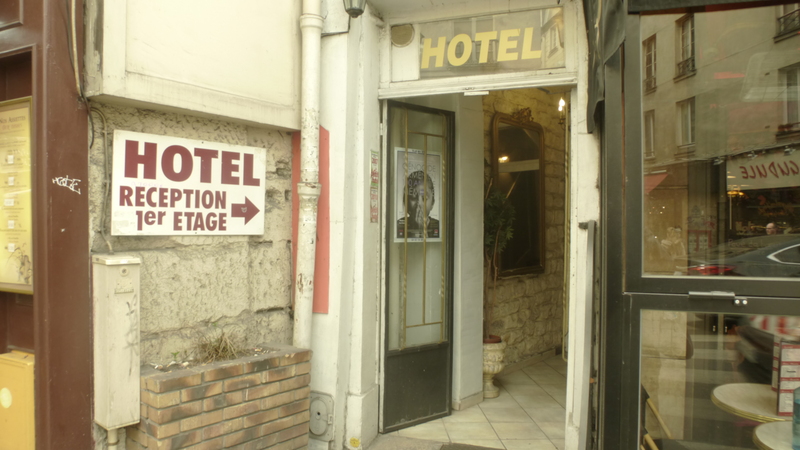 Friday 13/03/2015 – 2pm, walking down the Rue Dauphine, usual mixture of “typical” Parisian watering holes, a few less brothels than before though and a distinct hipster-inspired gentrification. I spotted a cheap hotel that I stayed in years ago. I remember writing this at the time. The synthetic ricochet of a cheap travel alarm, rising to crescendo in my still spinning head. The same synthetic noise made by those machines that support and monitor life in hospitals, and this morning I might just need to be connected to one . Oh please just plug me in, drug me up and send me off into a comfortable coma. It is Monday morning in the Latin Quarter. My waking thoughts are dulled after a sleepless night of fighting off the bedbugs in a cheap cockroach room in a convenient cheap hotel that also rents by the hour for those kinds of people who only need an hour – or frequently less. The peeling, nicotine-coloured wallpaper. The once, gaudy and tasteless floral pattern now yellow as a dried tobacco leaf, now as yellow as my fingertips. Waking in the half-light of purgatory, the morning sun dulled by the dubious dirty netting curtain, pinned across the window. Waking, shaking with the breathless anxiety of four days non-stop smoking and drinking. « Ten years,» we said. « We’ll meet up here in ten years and compare notes ». Who we are now. Who we were then, students in Paris, drinking in « Café Society », the left bank, St Germain des Près, the Latin Quarter – lolling round in cafés, spending our meagre grants on cheap wine and cigarettes – château plonk and packets of unfiltered Gauloises – their distinctive cigar like stench and their thick fog like smoke that hung heavy in bars. We, the great unwashed, sat back, sipping wine and drawing down great lungfuls of unfiltered smog. We philosophised, we criticised, we saw the world through the bottom of a glass and we changed the world imbued with wine and our own importance. Our naïve, sheltered, shuttered, narrow intellectual vision of the world. Middle class suburban kids playing at Jean Paul Sartre. Heading up the Rue Dauphine on my way to a photo exhibition at the Jeu de Paumes. Scurrying round a gallery like rats on roller-skates. Pictures hung in regimental lines on the medically white walls. Art on walls, there is something fulfilling about looking at neatly framed art on walls, and if you actually like what you see? Did you come here for the art or just for that feeling of self-satisfaction you get when walking round a gallery? No matter what is on the walls, it is the idea of communing with art and other art lovers. But I am with rats on roller skates, hurtling around, not taking the time to take it all in. My question, what is worse than scurrying round an exhibition you love with art rats, when you want to prowl round feline fashion? My first answer to my question – worse than being under the pressure of an indifferent entourage is actually having the time to saunter round an exhibition you loathe. Wrong answer – for if you loathe the art on the walls, then the art has fulfilled it’s objective, it has unlocked some kind of emotion within you, and much as you loathe the art, you go back for more. There is that strange thing with loathing, like a crust on a healing wound, you know you mustn’t touch, but you scratch away until you finally peal back the crust to reveal the hole, the gash, the soft, pink layer beneath and you feel sore but relived. No, worse than sauntering round an exhibition in a state of loathing is quite simply sauntering around in a complete state of indifference. I can stay, I can go, and I actually don’t care. I was curious enough to come in and I’ll at least stay here for a while to get my money’s worth and of course, use the toilet – the sculptural lines of the toilet fittings might actually be better than what is in the gallery. 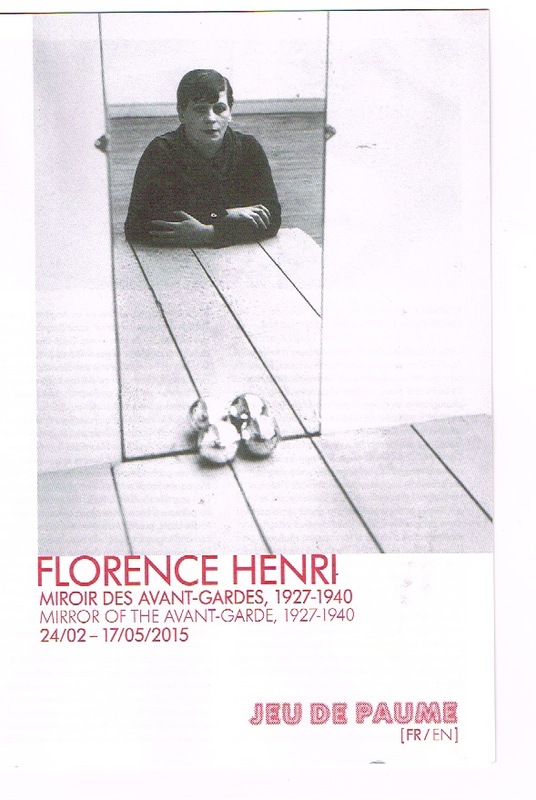 And such was the case when I sauntered round the Parisian photo gallery « le Jeu de Paumes » for an exhibition dedicated to the work of Florence Henri. Entitled « Mirror of the Avant Garde » it was just photo after photo of balls juxtaposed with mirrors. I always mistrust the term « avant garde » it just means someone has done something that no one has thought of before, but, in itself, that thing is of little interest or little artistic value. Posted in Ageing, Culture, France, French, Fun, Life, Music, Paris, Philosophy, Rock 'n' Roll, Tourism, TRAVEL, Wine and tagged cheap hotel, Latin Quarter, Noel Gallagher, Paris. Bookmark the permalink.